This summer one of our favourite things to do has been to venture into the back roads of Chilliwack and Abbotsford, bumping along past all the farms and marveling at all there is to see. Whether it's a tractor coming down the road overladen with produce, cows lounging in a field, or some really great old barns, we have a blast. Often we look at fields and try to guess what's growing, other times we complain about the ripe smell of manure. 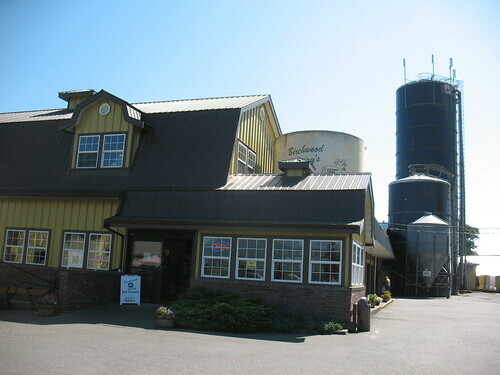 Recently we just stumbled across Birchwood Dairy. My first experience with Birchwood Dairy came from having their frozen yogurt years ago at a mall in Abbotsford, so it seemed only logical to take Kevin and satisfy our craving for sweet frozen goodness on a hot late summer day. We did get lost out there in the fields and random roads of the valley, but eventually we pulled up. Birchwood Dairy offers lots for the kids to do. You can get ice cream, but there is also some animals to pet and you can watch the cows being milked if you arrive at the right time. There's a small store where you can buy other dairy products that the farm produces, as well and sandwiches and various things. Besides those things you can sit outside at picnic tables and there's things to climb on and see. It's a great outing for small children! We were there for ice cream. I need to be honest - I think we are ice cream snobs in my house. Or, not so much snobs but ever since we figured out how to make ice cream at home and have been taught by James at Bella Gelateria how his gelato is made, we have very high expectations. Birchwood Dairy ice cream is good-but you if you looking for ice cream with nothing but natural ingredients such as milk, cream, eggs, sugar... well, not so much here. "WAIT! Do THOSE have soy?" She quietly put it back and Kevin settled for a cup instead. The ice cream was very tasty, but if Kevin can't eat most of them then it makes the experience somewhat frustrating. And... well I don't want to be picky but ice cream doesn't need soy in it. At all. So I'm not quite sure why it is in these ones. 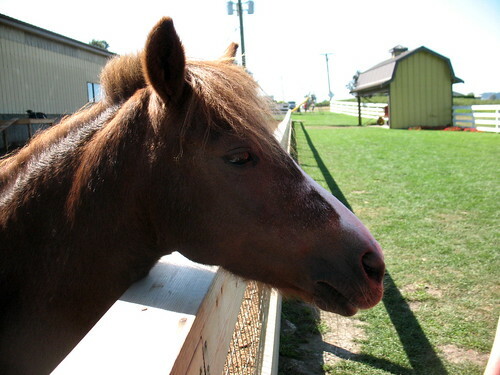 Once we were finished, we checked out the petting zoo animals, and were struck by how friendly this little pony was. In fact he was so friendly he followed us around and basically begged to be petted, which we happily complied. The other animals ignored us and stuck to the shadier areas of the pen. After the pony got bored of us, we discovered that we had come just in time to watch the cows be milked.We stood and watched the equipment be cleaned and the cows line up to be milked, but eventually left before it all got going. You can also go and see two cows close up in their pens. If you have small children, note that this is a farm and it will be smelly, and there will be cow poop on the ground near the pens. It's a good idea to watch where they step near the animal pens.You're going to want to have them wash their hands a lot, and there are facilities for that. 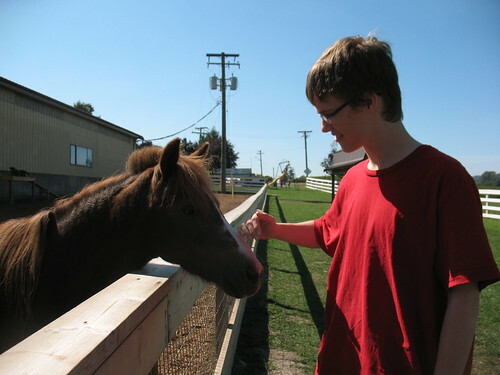 Now is a good time to head out to the farm-the weather is nice, the corn is high, and it's a pleasant drive. Plus it's always a good day for ice cream, right?